There was one handmade gift under our Christmas Tree this year. Luna (my 8 year old) and I made this for my husband. 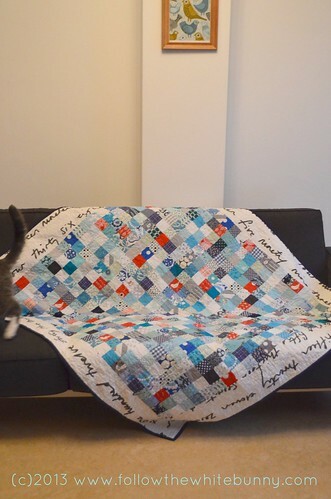 We started working on this Blue and White (with a bit of Red and Grey) quilt this September. I did most of the sewing and Luna arranged most of the 2.5" squares into blocks of 6 by 6 squares and some additional 'skinny' blocks of 3 by 6 squares. To create a random yet balanced colour arrangement we followed a 'special' formula per block: at least 3 solid white squares, 1 or 2 red squares, about 5 grey squares and the rest all blue, or white with a blue print. In addition to that we aimed to put 2-3 very dark squares (blue or grey) in each block and a couple of solids. I used fabrics from my stash, from my scraps and bought the white-with-grey- lettering fabric for this project at IKEA. Initially for the back but as I wanted to make the quilt a little larger I used it for the borders as well. I was not brave enough to try mitered corners on the border though... The binding is a dark blue Kona cotton. I love this quilt.... You and your daughter are quite the team_! What an awesome gift! The quilt turned out beautiful! What a wonderful gift!! And great thinking with your block "formula". I know what you mean about the quilting part of quilting. I too have a pile of finished tops, but the uncut fabric calls my name much more strongly :-). What a great idea to use the Bitten fabric as a border. I may have some in my stash. :) Have you tried reducing the speed of your machine when you machine quilt? Lovely quilt! Nice colour mix & border especially. Thank you! I tried hand quilting for the first time this year on a mini quilt and it went rather well actually. This quilt is rather large though and I really wanted to finish before Christmas :) Also: I don't have a quilting hoop or frame. Maybe I should get one?!? Love that you and your daughter made a quilt for your husband. So sweet to do together and makes it much more special. 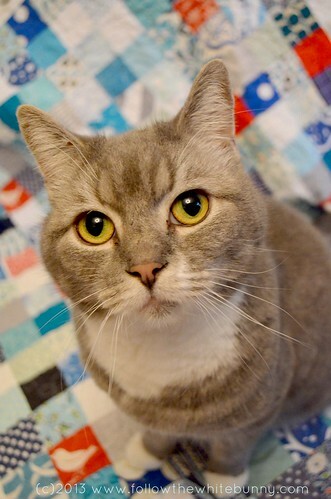 Love your kitty too ~ they always seem so attracted to any quilt! What a lovely quilt. I love the colors you used. Glad it is loved by the husband and Milo giving his approval. Wonderful quilt, Nicole ! I love the colours, too, and I always love the look of multiple little squares!